When I retired in 2002 we had five dogs. Four of them were ” older.” I’d been involved in agility since 1994 and we decided that we would only get another dog if it was a good agility prospect. Eventually our canine population was down to two and I started thinking about agility dogs. First decision was to get a Sheltie as a better fit for a sixty-two-year-old handler than other herding breeds. I started watching the MN Sheltie Rescue site and talking to Sheltie friends. Eventually one of them emailed that there was a new two-month-old Sheltie at the local Humane Society. She was the second dog I’d looked at. Playing with her she had such great drive and personality I started second guessing myself. I also thought she was more like four or five-months-old. I gave a $10 deposit for them to hold her awhile and went back with a friend, a long time USDAA judge. Practically her first words were to ask why I hadn’t already taken the dog home. One of our remaining dogs was a Schipperke. He had a huge personality and was a big influence in Meadghbh’s upbringing, especially in the areas of individuality and eating post cards that fall out of magazines. Meadghbh is pronounced Meeve and is usually spelled without “g.” It’s Gaelic and has been anglicized to become Maeve. She was a legendary Queen of Connaught in the Ulster Cycle of tales. Thanks to a gate steward at her first trial her nickname is Megadeth. Shortly after we got her Meadghbh and I did a six week obedience class which overlapped with an introduction to agility class. 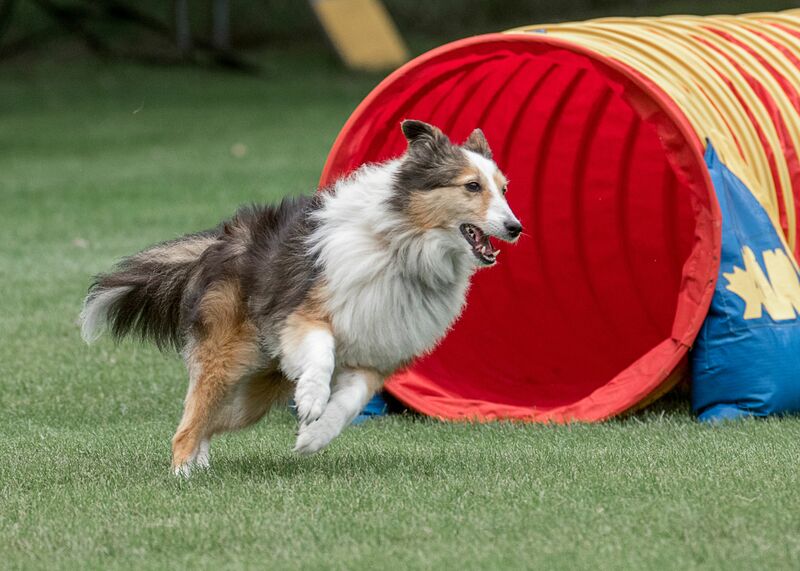 We continued a regular agility progression and started competing in August 2007. Things went fine until May of 2009 when she began limping at a class due to a luxating patella. She had surgery a week later. Structurally both legs were the same, but the surgeon said her good leg was so overdeveloped from covering for the other leg that he didn’t foresee it being a problem. He was right and we were back competing later that year. I’d been having ankle/knee problems and in classes starting in early 2009 I had other students do one run a class with her. Eventually, in competitions, I began cutting back on my runs and increasing Meadghbh’s runs with friends. One happy but unintended consequence of her ability and her willingness to run for anyone, was that she was selected by Team Australia to be on their team for the IFCS WAC in 2012. I also volunteered her to run team for three Aussies who came to the US to compete in the IFCS CCOA in 2013. By the time Meadghbh earned her ATCH in August 2012 eight of us had gotten Master Qs with her. As time went on I ran fewer and fewer runs. Last year I was still running Gamblers and rarely Relay. At this point all her runs are with friends. As one of her instructors said a few years ago, running agility is its own reward for Meadghbh. Of course, the treat after the run is also a big factor. Meadghbh has her ADCH, PDCH and Bronze LAA with over 330 Masters/P III Qs. Twenty or so with me, the rest with guest handlers. By now she’s had at least twenty handlers, some for a run or two and some for many runs. A big – THANK YOU – to our agility coaches, and all Ms M.’s handlers for being part of, and adding to, her enjoyment of life. Meadghbh is also a TDI Therapy Dog. She was part of a program at the local VA Hospital through our club in which returned vets, referred by the VA, were able to run members’ dogs one night a week. Ms M. still participates in a similar program we have for youths being treated at a local Children’s Home. Meadghbh is now eleven-years-old. Although she is Q’d up for PVP, PSJ and Performance Grand Prix for 2017, this will probably be her last Cynosport. On the other hand, if things continue to go well over the next year, she may be back for the Veterans Showcase.